Rawai Muay Thai sponsors fighters, both local and foreign athletes. If you want to fight you can join the fight training program. It’s hard work but it’s worth it and you learn so much from fighting. One reason people come to Thailand to fight is that it’s so easy to get fights. There are fights almost every night and you can get a lot of ring experience. Back in your home country you might be able to fight once or twice a year. But local fighters can fight more than once a month. In this section we post fight results about our fighters at Rawai Muay Thai. Keep up to date with your favorite fighters. 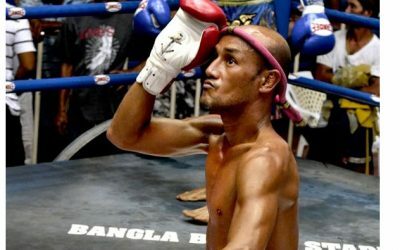 Lemsing, one of the more popular trainers at Rawai Muay Thai, has a long and successful career as a fighter. Incredibly, he has over 500 fights.